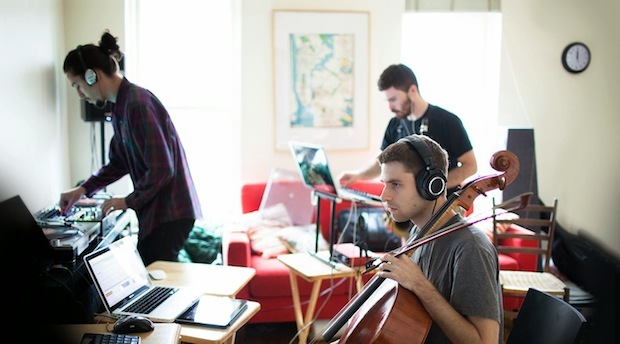 Dubspot Blog contributor Mike Steyels speaks with Brooklyn’s Archie Pelago trio about their fusion of live and electronic music that has been gaining popularity with labels like Mr. Saturday Night and DJs such as Mary Anne Hobbs. Archie Pelago are a trio of instrumentalists and producers based in Brooklyn who are looking to bridge club culture with live music. The three friends were all part of separate bands in the past, and met on the bass music scene in New York. Once they hit on the idea of bringing the worlds together, they set to work quickly, and in a couple years time have managed to gain the support of a wide range of people, from Mary Anne Hobbs to Ableton. Now, they’re set to embark on a tour around Europe. The altered saxophone melodies blending with warped cello harmonics and guided by intricate beat work is appealing to many. Although they cultivated their sound in the bass music breeding grounds, they have moved on from the label, refusing to accept any limitations. Their tracks range from housey grooves to freer broken forms, taking influence from footwork to garage to jungle and more. They span tempos, spill into lengthy forms with songs lasting over 10 minutes, and feature numerous live instruments affected by techie means. They even created a virtual tour to accompany one of their tracks. It’s as akin to contemporary classical and jazz as it is to left-field electronica. Dubspot: What’s new with your live set? Dan – I’m using Ableton Push now. It’s enabled us to start using a lot more broken down elements of our production in a more controlled environment for me. I can launch things through Ableton now. I’m still using Serato and the Bridge as well, so I have many options in terms of how we phrase our set. I’m using Ableton a lot now, which is a game changer. There’s a lot more original material, a lot more new material we’ve been stripping out and working on. Not only in a production sense, but a live sense simultaneously. So there’s a lot of improvisation going on? Z – There’s nothing pre-planned in our sets, Greg and I are flying off the seat of our pants. It’s just about communicating with each other. D – Yeah, just listening. They don’t know what tracks I’m going to play. I drop it and they react. We have elements of the tracks that we build in the studio that we’ve hollowed out, so I have control over the individual stripes and loops and arrange them how I want. It’s how I choose to sequence them on the fly that Greg and Zach have to react to. Does the improvisation play a role in the studio as well? G – Sometimes. We write in a lot of ways. Sometimes we’ll have sketches or beats ready, but sometimes we’ll just roll recording and see what happens. I have a humble studio in the back of my apartment. Z – Every song is created in a different way. Sometimes we’ll jam for 10 or 15 minutes, and whittle that down to the parts we like. Other times we get our heads around someone’s sketch. Z – We all write electronic music, we’re all producing. Dan plays trumpet and flute on stuff. I play sax and clarinet. Greg plays cello. But we’re all writing electronic music. Greg handles mixing and mastering because he’s obsessed with that stuff. But there’s no roles, like “Oh, Dan’s the DJ, so he’ll make the beats.” We’re all making beats. Full collaboration team over here. How do you build your drum kits? G – The kits vary. We have a couple sample packs. But there’s no real method, we just have a pool of sounds. Some of the percussion I use is derived from tapping my cello, and I was working in a studio that had a drum set that I sampled from. There’s been some live hand percussion. Some live textural stuff and mouth percussion. Z – We sample old funk drum hits. We take vinyl and digital samples. 808s and 909s are in there. We use whatever we can find. Sometimes we’ll chop breaks up. Do you dub each other, or do you stick to doing effects on your own instruments? G – We’re running our sets through Dan’s mixer which has a lot of onboard effects, so he can dub us if he wants to, but primarily we’re controlling our own stuff. D – What they’re doing tends to be pretty dense, so I try not to mess with it much. Sometimes I’ll filter down if I want to suggest to someone that we’re moving on or something. Usually very subtle, never cutting someone off or anything. Sometimes I’ll EQ something. How did you develop those communication skills? D – All three of us have ensemble experience, like being in jazz or rock bands. So just having that background and practicing together. Z – Playing live and seeing what works and what doesn’t. Seeing how the crowd responds. Trial and error? How do you work in other people’s music into your sets? D – I mix it in with Serato. I have two discrete Serato channels, as well as a channel for Ableton rhythms. And I can lace something into Serato via the Bridge and sync everything. Typically my selections are on the minimal side so I don’t clog up the sound space that Greg and Zack occupy. I’ll catch loops and sprinkle it in and echo it out. Sometimes I’ll let a track play and develop. It’s on-the-fly DJing. I typically keep it rhythmic. But sometimes there are melodic and harmonic changes, and when I introduce them they’ll have to react pretty quickly and change what they’re doing. How do crowds more comfortable with DJ sets react to your performances? Z – People are really into seeing something different. We’re playing dance tracks, so it’s not that far fetched that people can find something to gravitate towards. There might be a moment where people are like, “What is this? What are they doing?” Or people are checking us out on a technical level. But ultimately, people let go and enjoy themselves. D – And typically when people see us having fun they react to that. They see us communicating and looking out into the audience. People respond positively to that. Do sound systems set up for recorded music pose problems? Z – When we play live, we monitor internally, so we ask them to turn the monitors off. Sometimes if it’s a really big sound system the boom can be caught in my microphone or through Greg’s pick ups. So we have to tune our frequencies to the performance area we’re playing in. But all it takes is some time during soundcheck. G – As the cellist, I’m using an instrument that resonates through the space, so I usually have to make really hard, low cuts. I have to roll off my low end pretty hard sometimes, because a powerful system will really pick it up and take it beyond where it might be in a more comfortable system. Also, I have a lot of overtones in a cello, so a lot of finesse is required. Do you find that the techno/house community has been accepting? D – Definitely. I mean, we dabble in a lot of house and techno in our own productions, and we enjoy a lot of that music ourselves right now. So parties like Mr. Saturday Night, Resolute, or Discovery have been embracing what we’re doing. With something like “bass music” losing relevance, do you find it hard to place your music in a popular context? Z – We’re not making “bass music” or “house” or “techno.” There might be elements of these and more in our music, but we’re just creating our own stuff. Our own sound. I welcome any destruction or creation of terms to describe our sound. I personally think the term bass music belittles our music. It’s closed minded. Some people could say it’s open and there’s a lot of interpretation, but we’re making 15 minute beats, and leaning more into classical or jazz compositions. So putting the term bass music on to our music sounds a little far fetched. G – I think the labels come and go, but our sound and how we interact goes on our own compass. It’s easy in some ways to use bass music as a catch all, but it’s also hard when we start doing things that are clearly not part of bass music. The merits of “bass music” itself aside, some genres are more open minded than others. Do you feel like moving into territories like “house” or “techno” that are more restrictive poses any problems? G – I think we’re actually moving into more open-minded territories. Our newer music has less to do with tempo boundaries or aesthetic limits than it does with exploring and defining our own sound. I see more doors opening, like to indie crowds, jazz audiences, or contemporary classical audiences. Z – We come from such disparate backgrounds, that we’re just drawing from all strains of electronic music and non-electronic music. For the record, we are moving away from specific labels and sounds. So what type of bookings are you getting? G – Our April tour is basically electronic music parties that aren’t really settled in one specific style. For example, Boiler Room. They book people from the entire spectrum. I don’t know what the Glasgow Schoolnight does, and I don’t know what Piaf in Antwerp does. But they’re electronic music promoters that we think are taking a bit of a chance on us on our first European tour. There’s no real pattern here. It’s just people who are just interested in trying something. Like we’re playing MUTEK and opening for Shackleton, but it’s at a contemporary art museum. What would the perfect setting be for your performance? Z – It’s more about the feeling. The reaction. I don’t care if it’s a crowd of 30 people who are with us the entire night going crazy in a basement, or if it’s an auditorium with 20,000 people. It’s just about being in a space with comfortable sound where our sonic entities come across. G – It could be a Tokyo skyscraper. It’s all fair game. There’s a lot of dream venues we all would love to play. But I think it’s more about us being in the zone and feeling good about how we sound. We just want to feel connected to the audience, and you can have that anywhere. Have you ever tried using MIDI receptors on your instruments? Z – I once saw a MIDI sax, but the beauty of our electro-acoustic combinations is getting the tones of a natural instrument and processing them. I have a EWI at home – an electronic wind instrument – that’s kinda busted, but I tinker around with it. But for me I’d rather be playing a real instrument. I think there’s not enough demand for those type of instruments, so they’re not fully developed. Like my EWI has a problem with shifting octaves that a lot of people I’ve talked to have similar problems, so it seems like a problem with production. If it worked, I might use it sometimes, but I just prefer the saxophone sound. Besides, we have enough synths in our stripes and in other people’s sounds. Right now I just want to make clear to the audience that this is a saxophone. G – And the cello is too wild, it has so many overtones and crazy things going on. I’ve tried using things to approximate my sound into a MIDI signal, but they’re not exact enough. So I focus on acoustics and processing. We’re very deliberate in what we add to our setup. We never want to have to much stuff. We don’t want to continually add and add and add until it’s this crazy pile of gear. We try to be efficient. We’ve been very mindful about having only what we need. How many bags of gear do you travel with? G – I have a travel case and a suitcase that doubles as a bag I can bring to a gig. Z – I bring my sax and a backpack that I can put all my gear into. D – That’s always the X-factor. Do you ever collaborate with other instrumentalists? G – Yea, my friend Spencer played bass on some stuff of ours. A lot of vocalists. But we compose music together as ourselves, so when we bring people in, it’s more of a guest role than a collaboration. Z – The only time we ever did a full on collaboration was with Suuns and then with Grenier, who was more of a production collab. How do you like Ableton Live 9? G – I love it. I’d felt like I had gotten to the limits of 8. I like the mundane stuff about 9. I like being able to hit Command-F and search for every sound and effect in my library. I like the curved automation. The Glue is a really nice compressor. I’ve been using Ableton since 1.5. What are the problems and possibilities you’ve come across with Push? D – Problems? The interaction between Serato and Ableton is not always 100 percent stable when I’m starting up. And sometimes I won’t receive the correct soundcard options from Ableton when I load Serato. But we’ve sort of figured out the order of operations to avoid that, so it’s not a huge issue. Push has allowed us to strip out a lot of original material, I have some drum kits that I can generate on the fly, and build drum kits and sequencing as we go. I’m getting into melodic sequencing soon, but not much because we don’t want to clutter the live components. I’m still honing and learning. I’m a new Live user too, and I learned to use it via the Push. It’s been an intuitive and tactile process. What’s up with the Archie Pelago label? G – It’s going well. We’ve released three of our own records, and we’re releasing another artist’s stuff next. But we’ll be creatively involved with that project too. We wanted to release music in our own way and in our own terms. And we felt the time was right and ripe. We had music that we figured established labels wouldn’t take a chance on. All of the releases are vinyl and digital. The majority of people who check us out will do so electronically, but there are enough people who really like to consume vinyl, particularly in Japan. So why not give them what they want? The tracks are mixed and mastered differently from the MP3 versions, so you’re getting a subtly different track. Z – People like to own a physical thing, play it on a device, own a collector’s item. I’m a collector of vinyl myself. We’ve been selling out, so the market’s there. We also have amazing artwork by the designer Calvin Ho. It’s also a bit of a cache thing, and we wanted the experience of releasing our own vinyl. We do runs of 300-500 per release. Breaking even or running at a modest loss was always the goal. But the gain that we got from awareness has made it worth it. G – Just be open minded and don’t box yourself into a specific style. We encourage thinking outside the box in all things. That’s pretty succinct but worthwhile. Have fun on tour! Mike Steyels is a writer based in Brooklyn who focuses on forward-thinking electronic music, regional sounds from around the world, rap, dancehall, and more. His work can be found in THUMP, Vibe Magazine, MTV Iggy, and Dubspot. Follow him on Twitter at @iswayski.